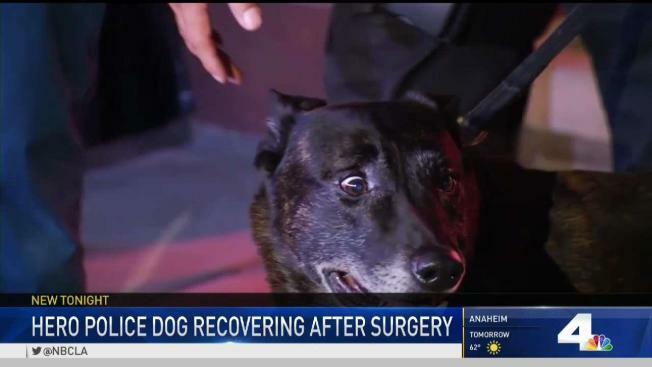 A Santa Ana police dog was getting a lot of love and affection on Tuesday as he underwent surgery on his jaw after he lost teeth biting a wanted parolee after a chase. Puskas, an 8-year-old Dutch shepherd, chased down Antonio Padilla Jr., 37, of Riverside, on Monday night in an industrial complex in Irvine. The dog lost all of his upper and lower teeth, except for his canines, officials said. He had surgery on his jaw and was recovering Tuesday afternoon, said Cpl. Anthony Bertagna, a Santa Ana police spokesman. Padilla was taken to a hospital for bites to his arm. When he recovers, he's expected to be booked into the Orange County Jail, police said. The pursuit happened when undercover police spotted a black GMC pickup truck driven by Padilla Monday night in Garden Grove. When officers tried to pull him over, he sped off. The parolee is accused of using his truck to try and run over an officer during a traffic stop on Feb. 18, police said. In the pursuit, Padilla ran red lights and sideswiped cars. At one point, he rear-ended a Mercedes wagon before pulling a woman out of her SUV and taking off, aerial footage of the chase showed. The woman's brother, Ricky Kozloski, tried to pull Padilla out of the SUV but backed off when Padilla pinned him between vehicles as he tried to drive off. Neither Kozloski nor his sister were hurt. "I saw that he was taking my sister out of the car and I just reacted and tried to help," Kozloski told NBC4 later. Puskas, named for a Hungarian soccer player, was brought onto the Santa Ana Police Department in 2012. An Orange County Register article featured Puskas in body armor biting the padded arm of an officer during training. Dog lovers wished Puskas a speedy recovery. "Awesome job and praying that Puskas recovers, gets some implants, and can stay in service," Jerry Boyd, a former Irvine police officer, on Facebook. "That is the most awesome K-9 takedown I have seen in my 43 years in LE. Great dog." Wrote Chris Mushet: "Praying for this very brave officer Puskas and his handler. You are both amazing!!" "He's a trooper," Santa Ana Police Department Handler Officer Luis Galeana said of the K-9. The dog will be out for a couple of weeks, but then he'll be back on the job. VCA Yorba Regional Animal Hospital is currently accepting donations, presents and gifts for Puskas.